Best Sewing Clips ! They come in sturdy Tin Gift storage box.You will never lose them! Make it easy to hold multiple layers of fabrics, binding objects like Quilts, and holding together multiple objects. No Pins needed for Sewing! Perfect for all sorts of crafts. Can be used for post notes and organize papers as paper clips or use them on rope to hang pictures or mementos on there are so many different options of how to use them. Each clip opens wide to hold layers of fabric and the clip base is flat for easy feeding to the presser foot.Replace your old pins and never poke your fingers or damage your materials again, you can now sew safely with these must have clips. Package includes:100 Pcs. Clips Size : 2.5x0.8x1.3cm(LxWxH).Packed in many different beautiful tin boxes that will be shipped randomly. Sewing Clips is the necessary for quilting binding,they are safe,Pins can put holes in knit and using wonder tape to hold everything can get expensive. Then there are clips. Clips are great for holding the fabric together and in place. They do not add holes and you can use them over and over again. More clips use waiting for you to describe. 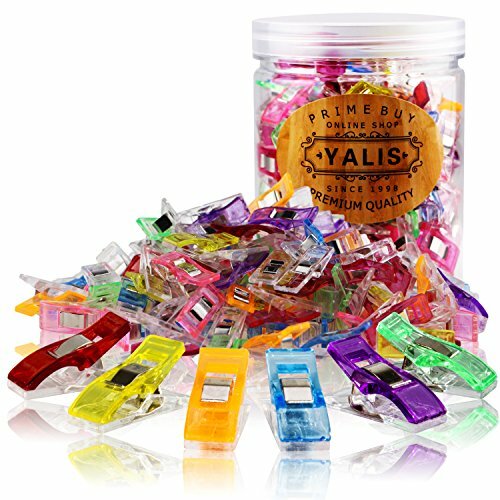 HIGH QUALITY AND CLEALY,The variety of bright transparent and vibrant colors and different sizes allows you to choose the clip that fit your materials best make the contrast and easy to see against any material.They come in sturdy Tin Gift storage box.You will never lose them! The Little Clips Have Helpful Guide Lines at the Bottom of Each Clip - markings at 5mm, 7mm, 10mm, making it easy to measure how far the clip is reaching into the fabric. Wonder Clips Opening width both are 0.9cm,it is easy to hold several thin fabics in place. without putting pins or holes in the fabric,It helps stitching your many things,makes things easier to be finished. Safer and Reuse.they are safer than straight pins that pricked fingers and stabbed feet when they got lost in the carpe,and they do not add holes and you can use them over and over again. 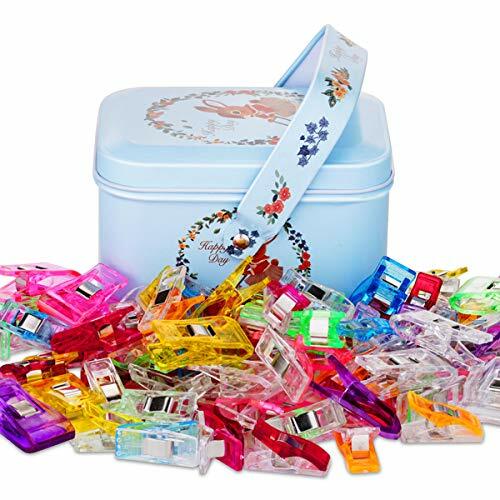 Package includes:80pcs little, Clips Size : 2.7x1x1.5cm(LxWxH) And 20pcs middle ,Clips Size : 3.3x1.8x1.2cm(LxWxH), Packed in a beautiful tin box. 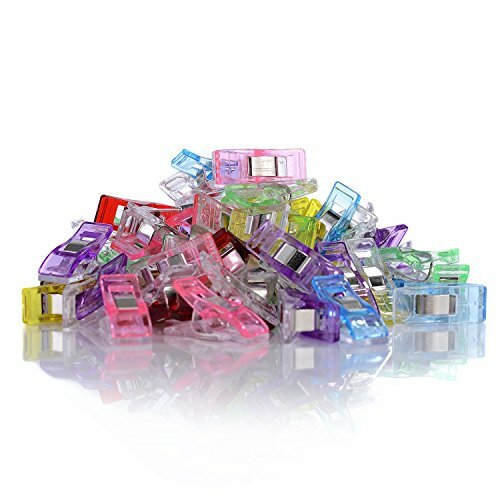 Specification: Package: 100pcs mini clips + tin box Assorted Color: pink, red, blue, yellow, green, purple,orange Material: plastic durable Size: approx. 2.7*1*1.5 (L*W*M) The flat bottom of each clip has markings for 1 mm and 3 mm so you can measure how far the clip is reaching in We promise offer good quality products to make sure your satisfaction. We make every effort to provide quality services. You could contact our customer service when there any questions. Not satisfied? 100% guaranteed return of goods. Great Gift Idea,Best Sewing Clips ! They come in sturdy Tin Gift storage box.You will never lose them! Great alternative to pins and do no damage to fabric for many crafts. The true list of uses for clips in sewing and craft projects is probably endless. But here are a few of the major ones. 3)Teaching young children to sew: When you're helping a little one learn to sew, you teach him or her about the dangers of the machine needle. But they're probably ten times more likely to get poked trying to put in a pin. Or they knock the pins onto the floor where everybody gets the chance to be poked. Warrenties: We offer 90 days money back and one year NO Questions asked warranty GUARANTEE. So what are you waiting for? Go get one right now while we have them in stock or maybe order some extra as gifts for your best friends. BEST VALUE MATERIAL - Plastic + metal, high quality. This clip base is easily to hold the layers and make the cloths level and flat. 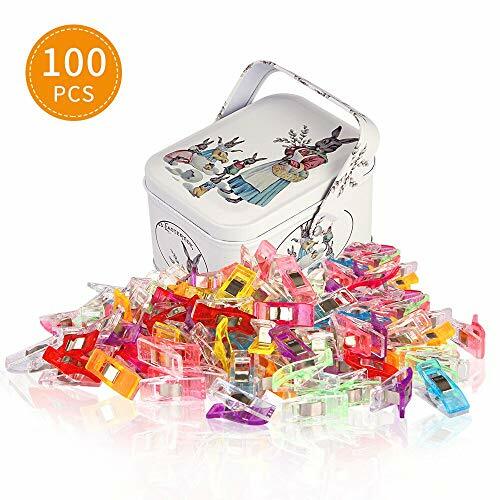 Package contains 100 cute multicolored sewing clips. MULTIPURPOSE - Our sewing clips with great holding capacity are perfect for making quilts, handbags and more. It's suitable for holding layers of shirt, cloths ,trousers and tie etc. SAVE YOUR FINGERS AND MATERIAL - Replace your old pins and never poke your fingers or damage your materials again, you can now sew safely with these must have craft clips. EXCELLENT GIFT - These clips can be used for post notes and organize papers as paper clips or use them on rope to hang pictures or mementos. The craft clips are easy and accessible in storage. It is an excellent gift for craftsmen. SATISFACTION GUARANTEE - Quality guarantee. 5-star customer service. No questions asked. However, we are quite confident that you are going to love these clips and will return only to order more. - Return ship your product within 30 days for a full refund or replacment if you're not satisfied. - Any question you have, please don't hesitate to contact IPOW Support Team. We will get you back within 24 hours. Small clips have Marking Lines for 5 MM, 7 MM, 10 MM.Mediums don't have.So you can measure how far the clip is reaching in from the fabric edge. 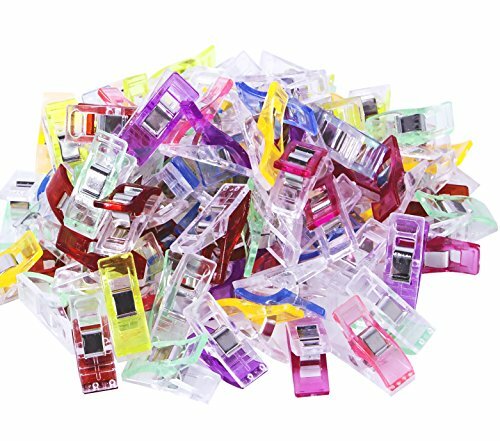 100 Pack Quality Plastic Transparent multicolor clips.Flat Back won't affect sewing machine work when still holding materials in place. Can Be Opened from 7 MM to 12MM.Easy to hold multiple layers of fabric.No Pins needed for Sewing. Meet multiple needs of sewing quilts, handicraft, binding papers, hand craft work, and etc. 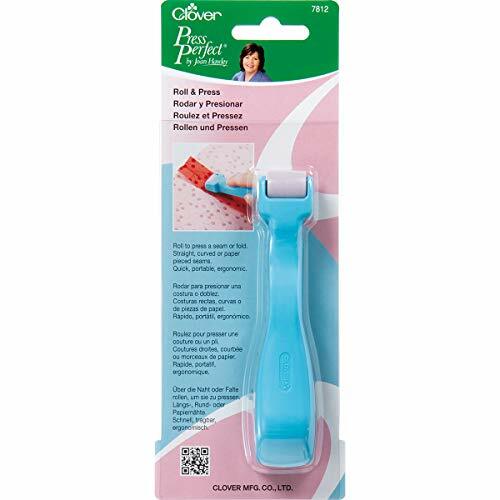 The Roll & Press by Joan Hawley is a convenient and quick way to press seams at the sewing machine. Roll to press a seam or fold. Straight, curved, or paper pieced seams. It won't pull or distort fabric; the wheel is tapered to focus pressure on the seam. Comfortable, ergonomic handle. Perfect for paper-piecing or laminates; also use to seal glued seams on leather and felt. Brand: Clover | Manufacturer: CLOVER MFG.CO.LTD. These sewing clips are perfect for all sorts of crafts cloth art. Assorted colored helping mark the fabric. The flat bottom of each clip has marking lines for 5 mm, 7 mm and 10 mm, so you can measure how far the clip is reaching in from the fabric edge. No need to worry about the clips dropping on the floor, poking or hurting children. Each clip opens wide to hold layers of fabric and the clip base is flat for easy feeding to the presser foot. 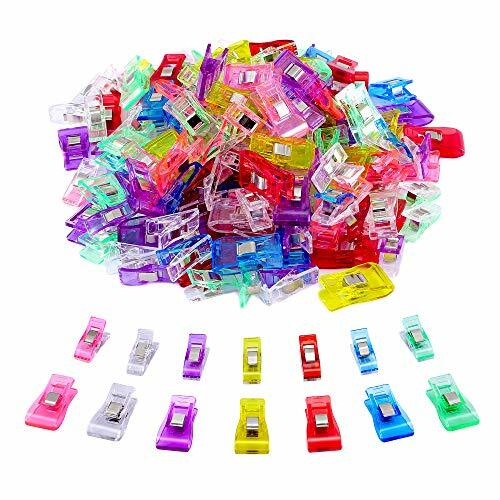 Package includes 100 pack of 27x 10mm colorful clips. 9 colors: Clear, Green, Blue, Pink, Hot Pink, Yellow, Purple, Orange, Red. Might not equal for each colors), packed randomly. 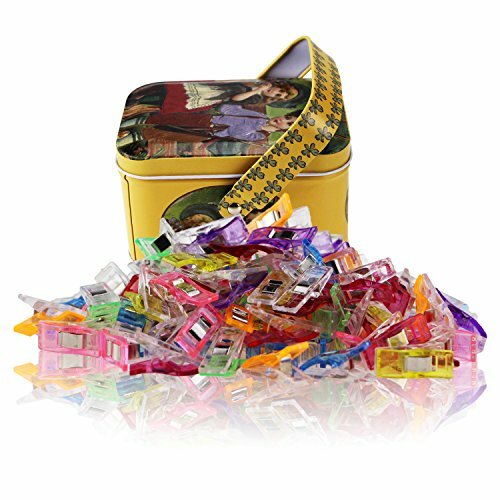 Package includes 100 packs of 27 x 10 mm colorful sewing clips. Assorted 9 colors, packed randomly. No need to worry about the clips dropping on the floor, poking or hurting children. Each clip opens wide to hold layers of fabric and the clip base is flat for easy feeding to the presser foot. 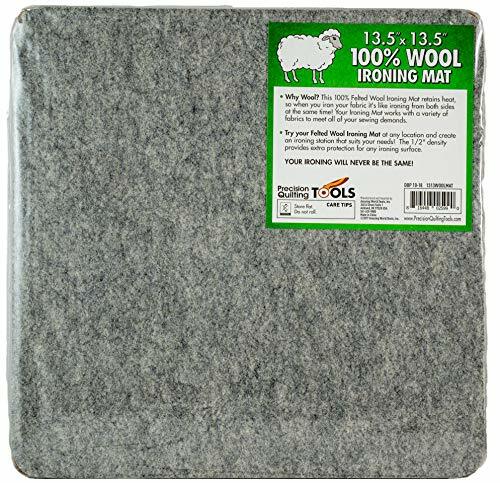 13.5" x 13.5" Wool Ironing Mat - 100% New Zealand Wool Pressing Pad, Portable for Quilting Guilds and Classes! Why Wool? This 100% Felted Wool Ironing Mat retains heat, so when you iron your fabric it's like ironing from both sides at the same time! Your Ironing Mat works with a variety of fabrics to meet all of your sewing demands. Try your Felted Wool Ironing pad at any location and create an ironing station that suits your needs! The 1/2" density provides extra protection for any ironing surface. Quilters love this ironing mat as you can put it next to your sewing machine or on any table. With a portable tabletop ironing board, going to classes and working on projects just become easy! Your ironing will never be the same! Performance: This 100% Felted Wool Ironing Mat retains heat, so when you iron your fabric it's like ironing from both sides at the same time! Quality: Made with 100% New Zealand Wool for professional results! Portable for Travel: 1/2 density provides extra protection for any ironing surface. Try your Ironing Mat at any location and create an ironing station that suits your needs! Efficient Pressing: This thick wool pad will keep your fabric stable while ironing to minimize stretching. Projects including yarn and embroidery can be pinned into the wool for easy blocking. As some irons use pressurized steam which can go through the mat we recommend ironing without steam. 100% Satisfaction Guarantee- If you're ever unsatisfied with the product we will refund your order. We have a no-hassle return policy. Precision Quilting Tools is a USA Company with U.S. Based Customer Support! Quilt Clips from Cottage Mills are the new quilter's standard. These 3" diameter clips hold your rolled quilt to make hand and machine quilting easy. They are made of sturdy plastic construction and will not scratch your sewing machine or furniture. Though made of plastic they still offer the strength of metal bicycle pant leg clips (the old standard). In addition, they won't rust, stain, or snag on your quilt. "These are a dream come true and so helpful!! I don't know how I functioned and quilted prior to these rings. Highly recommend as they are easily placed and yet still flexible enough to hold the quilt in rolled up position while quilting!" "I loooove these clips....grip great, just tight enough...no problems with them slipping...keeps quilt in order while I run it through my home machine." "Does just what it claimed it would do - compact makes storage easy. Flexible and held up to some rough handling. These were great when I was working on a full-size quilt." "I love these clips. I was machine quilting and found that I was fighting with the fabric all the time. I now use these every time I am quilting and that has made it so much easier to quilt the large projects. "Ah ha!! These are a real problem solver. We welcome any questions you may have about our products and thank you for your interest. Check out our other items: PixPen, PixMag, PixCase, BagTag, PixStylus, CardPen, PixMug, sewing notions, and ink pen refills. Clips keep your quilt rolled up and out of the way when quilting. Easy to remove and to reposition. Made of heavy duty plastic construction but they won't scratch your machine or furniture. 3 diameter by wide. Plastic clips won't scratch your sewing table or machine; nor will they rust, stain or snag your quilt. Value 8-pack is enough for most queen size quilt projects. ** SPECIAL ** Get 5% off when you buy 2 or more Cottage Mills products. Keep your quilt at the proper tension with the Flynn Multi-Frame Quilting System. Use this 3-roll quilt frame with your sewing machine for no-baste free motion machine quilting, or hold it in your lap for hand quilting. Includes two roller pipes made of PVC, three fiberglass rods for rolling the quilt easily and smoothly, side tension ribbons, three muslin leaders, plus an instructional DVD. This frame accommodates quilts up to 38" wide - an ideal size for wall hangings and to learn with. You can easily modify it to accept any quilt width by making new rods - simply purchase 3 pieces of metal conduit (EMT) of the desired length at your local lumber yard, and move the round nylon rod ends from your original 48" rods to the new rods using a Phillips screwdriver. Because the frame itself does the moving, it can be used with virtually any home sewing machine. 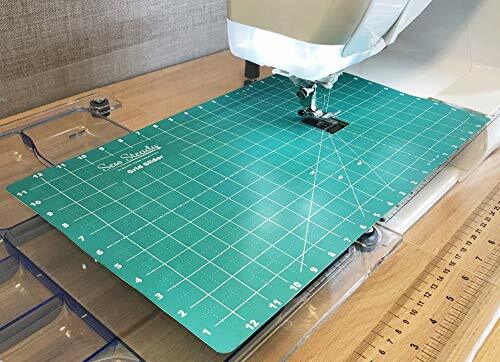 The grid markings on this free motion quilting slider mat will help guide you with straight lines and 30/45/60 degree angles. The slippery surface allows for easy fabric glide. The tacky back adheres to your sewing machine or extension table and is removable. (Extension table not included.) Comes with a plastic tube for storage. Easy care - wipe with a damp cloth. Tacky back adheres to sewing surface and is removable. Extension table not included. Pressing out wrinkles is the key to flat seams & beautiful blocking. But ironing mats easily develop ripples, making smoothing wrinkles impossible. Betta Quilting 100% New Zealand Wool Ironing Mat is a half inch thick, perfectly smooth ironing surface with a wrinkle-free iron every time. Click ADD TO CART now for a perfectly flat seam every time today. CAN THIS BE CUT TO MY CONVENIENCE? Yes, however to cut the half inch thick Wool Ironing Mat you will need very sharp scissors or utility knife. If cutting to your desired size, we recommend using a straight edge (ruler works well) to guide a utility knife. Be sure to cut on top of a cutting surface to not damage the table, and after 3 or 4 passes with the utility knife you will have a nice, clean cut. CAN THIS BE USED WITH STEAM? Yes, like a small ironing board, the 100% New Zealand Wool Ironing Mat can be used with both steam irons & dry irons. When using steam irons, to be careful we recommend using the mat only on surfaces not easily damaged by warm water such as plastic tables or delicate wood tables. Iron away, you're covered by our 100% Money Back Wrinkle-Free Guarantee, no questions asked. Click Add to Cart now for a perfectly flat seam every time today. 2 PIECE KIT | LARGE SIZE & TRAVEL SIZE | ... Includes 2 x Wool Ironing Mats for quilters (17x24 inch Large & 8x8 inch travel size ironing pad). Your at home & on-the-go Wool Pressing Mats. IRONS FROM BOTH SIDES ... The heat retaining properties of 100% New Zealand Wool holds heat so well it's like ironing from both sides. Get flat seams in less time with more effectiveness. NON-SLIP | GRIPS FABRIC IN PLACE ... Our smooth NZ wool holds onto fabric better, making ironing small embroideries & blocking a breeze. Avoid burns with 1-handed ironing. NO RIDGES | PRECISION IRONING ... Consistent surface with no ridges rids fabric of those pesky fold lines quickly & efficiently with 1 or 2 passes with the iron. No ripples, ridges, or divots. THICK | PROTECTS SURFACES ... A thick half inch of heat absorbing New Zealand Wool stops the iron from damaging surfaces below. Enjoy ironing where you prefer without burning the table. Ironing your fabric can be a tad difficult without the right ironing mat! But you know what, we have got you covered! Oh yes, with our uniquely designed felted wool ironing mat, you have an ironing mat that you can always rely on to deliver exactly as it promises. Our ironing mat for quilting has been prepped to retain heat so that when ironing, it feels like you are ironing your fabric from both sides. With a density of 1/2", our wool ironing blanket provides that extra bit of protection for any surface. It also boasts of a 17" x 24" size which makes perfect for ironing any size of fabric. This wool ironing pad will not only keep your fabric stable while ironing, but it will also prevent squeezing. Our superior wool ironing mat provides you with an extra soft and smooth surface that delivers a remarkable ironing experience. More so, it is portable and can easily be carried around. It is made using 100% New Zealand wool that has been lauded one of the best in the world. Do not leave your iron on the wool mat for too long. Iron setting : use WOOL or MEDIUM HEAT for best results. Use of steam : With prolonged use of steam during ironing, a small amount of moisture can pass through the mat, since wool is a porous material. Cleaning: Simply rinse it in sink or bath and hang to dry. Note, do not wash with machine. Drying: When wet, simply hang to dry. Avoid twisting or bending. Storage: Avoid folding or rolling. Find a flat surface and place it there. Also avoid storing the mat when it is damp or wet. For people sensitive to wool fragrance: you may experience a slight smell of wool at the beginning, not to worry, it fades off after a number of use. Rest assured the odor will not be transferred to your fabric and disappear soon after your ironing is done. TOP NOTCH QUALITY: To deliver a professional ironing experience, our ironing mat has been made using high-grade 100% New Zealand wool that is known for their fine quality. SUPERIOR PERFORMANCE: Our 100% wool ironing mat has continued to give others on the market a run for their money and that's because it has proven to retain heat while delivering a remarkable ironing experience. With our ironing mat to the rescue, it's like ironing both sides of your fabric at the same time. IMPECCABLE IRONING EXPERIENCE: Ironing your fabrics is now smooth, easy and hassle-free, thanks to our ironing mat. 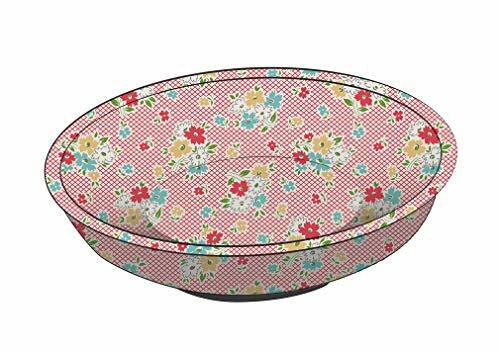 The cool part is that our ironing pad is designed to keep your fabrics stable while ironing to prevent unpleasant stretching that may make your fabric unappealing. SUPER PORTABLE AND PERFECT FOR STORAGE: Another reason our wool ironing pad has become a lot of people`s favorite is that it is portable and easy to storage. Plus it boasts of a size of 17 x 24 and a 1/2 density which provides that extra protection for any surface. 100% GUARANTEE: Its either you're satisfied or you get a full refund with no questions asked. This is because we place a huge premium on customer satisfaction. Click add to cart to place your order right away. Pressing effectively - As a quilter, we know how important it is to press our pieced items effectively. It can make a tremendous difference in how the quilt lays, how it measures when completed, etc. Time efficiency - Because you are effectively ironing both sides at the same time the result is quicker and earns better results. 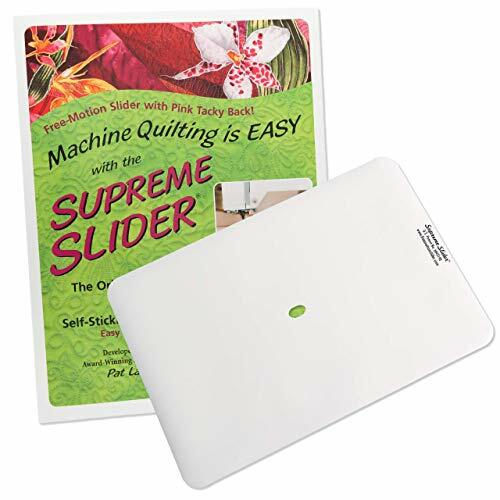 Convenience and portability - Many quilters travel with their quilting gear and will value the portability of this handy pressing pad. Whether it is to your Quilting Bee, Guild Meeting, or a Quilt Retreat/Cruise, it will fit nicely in your quilting machine bag. 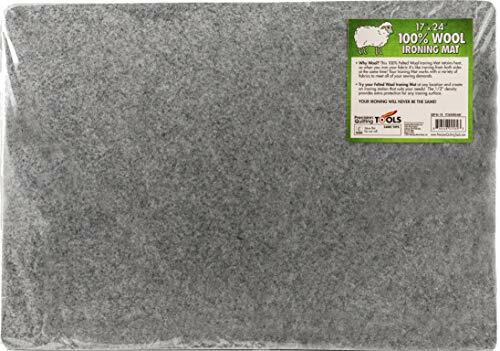 Best Quality - We know this 100% Wool Pressing pad is the Best Quality and will last a lifetime, so if you have any product issues, we re very happy to either provide a refund or a replacement! 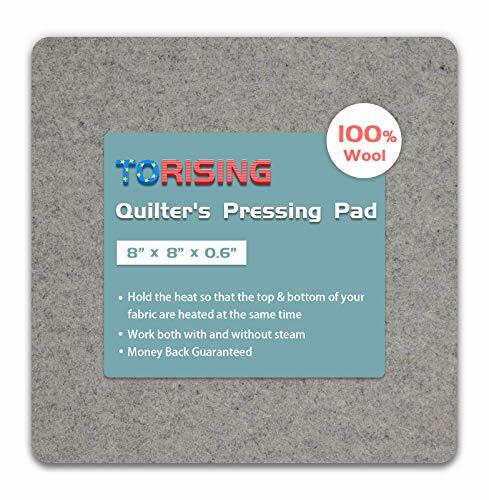 Add this Quilter s Pressing Pad to your Amazon Cart today. Quilter's love this pressing pad and it doesn't matter whether you use steam or no-steam as the result is still crisply pressed seams. Heat is trapped in the pressing pad and then radiates back up to the underside of the fabric therefore, effectively ironing both sides at the same time. Dense interlocking wool fibers of this pad hold the fabric to minimize stretching while ironing. Stretching often happens with half-square triangles and piecing done on the fabric bias but this portable ironing pad helps to prevent that leaving crisp seams without stretching. This thick wool pad is ideal for blocking your embroidery or yarn projects as they can be pinned directly into the wool pad. Because there is some give to the wool surface, when ironing embroidery projects there is less chance of losing the dimension to the embroidery, while not flattening the threads. Satisfaction Guarantee: Our Pressing pad is backed by our manufacturer 30-day money back guarantee. 17" x 24" Wool Ironing Mat - 100% New Zealand Wool Pressing Pad, Perfect Ironing Station for Quilting! Why Wool? This 100% Felted Wool Ironing Mat retains heat, so when you iron your fabric it's like ironing from both sides at the same time! Your Ironing Mat works with a variety of fabrics to meet all of your sewing demands. Try your Felted Wool Ironing Mat at any location and create an ironing station that suits your needs! The 1/2" density provides extra protection for any ironing surface. Quilters love this ironing mat as you can put it next to your sewing machine or on any table. With a portable tabletop ironing board, going to classes and working on projects just become easy! Your ironing will never be the same! Efficient Pressing: This thick wool pad will keep your fabric stable while ironing to minimize stretching. Projects including yarn and embroidery can be pinned into the wool for easy blocking. 100% MANUFACTURER MONEY BACK GUARANTEE - If you're ever unsatisfied with the product we will refund your order. We have a no-hassle return policy. Precision Quilting Tools is a USA Company with U.S. Based Customer Support! Includes 30 day warranty for products purchased from an authorized seller. GWHOLE Clips are great alternatives to pins, especially when working with heavy weight fabrics, piles, and vinyls. It can hold layered sections of sewing projects such as handle connectors to handbags and piping without distortion. It holds quilt binding while sewing, it's easy to see and easy to find when dropped on the floor. These mini clips feature great holding capacity and have a multitude of uses. Replace your old pins and never poke your fingers or damage your materials again, you can now sew safely with these must have clips. 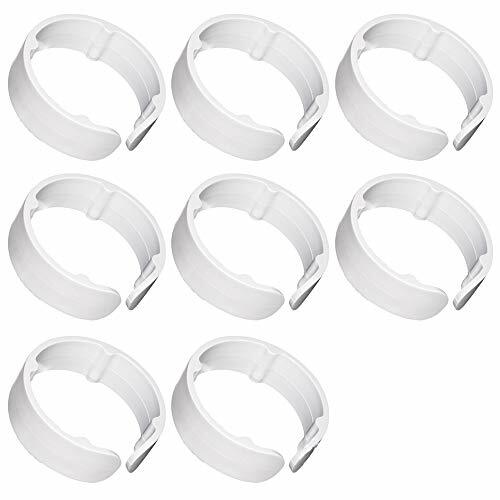 Package includes 60 pack of 2.7x 1 cm clips. Perfect for making quilts, handbags and more! Pure and Natural - 100% wool, fleeced and tightly felted to make the Quilter's Pressing Pad the perfect ironing surface for all your quilt block and small fabric pressing needs. Steam or other sprays are unnecessary because wool actually absorbs moisture from the air as heat is applied. This creates an additional heat source underneath your fabric, giving you crisp precision as you iron. This is by far the best ironing surface I have ever used - it is truly that fabulous! One of those investments and tools you won't want to be without whenever you sit down to sew. TIPS: - Always have your iron setting to WOOL or MEDIUM HEAT for best results. -Do not leave your iron on the Pressing Pad for too long. - Because of how wool absorbs moisture from the air, always use your Quilter's Pressing Fleece on a water resistant surface. - -The Pressing Pad is made of wool, so be sure to store it in a well lit room or airtight container. - For someone who is sensitive to the wool fragrance the wool may create a scent when used with steam. You may be able to smell a slight odor in the beginning. However, it will disappear soon after your ironing is done. - Most modern irons use pressurized steam, and since the wool mats are porous products, it is quite likely that steam will go through the mats. When you iron on our wool mats it's like ironing from both sides, so we recommend using a dry iron for best results. -The pressure Mat has a slight smell of wool in the beginning; however, there is no smell after using it twice. The odor will not be transferred to your fabric. 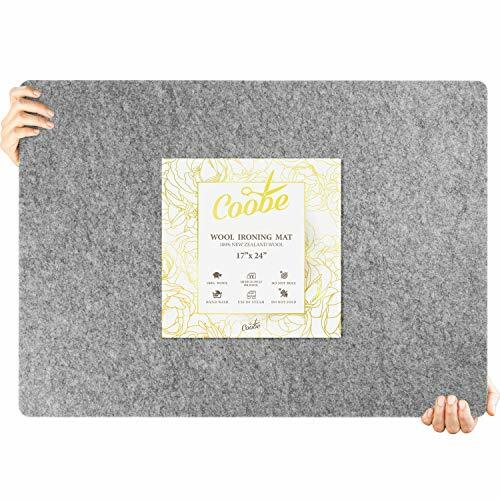 ADD TO CART NOW and you ll fall in love instantly with this Wool Pressing Pad! PRO STANDARD IRONING WITH OR WITHOUT STEAM: With a premium quilting pressing mat made of 100% wool, with dense interlocking fibers preventing stretching & making your quilting ironing an easy, fast, most efficient task. PERFECT FOR SEWING, EMBROIDERY & DIY CRAFTS: Designed in the ideal shape for convenient ironing, this wool heat pressing pad makes your handy sewing iron pad for detailed sleeve or pant seams ironing, your embroidery mat or your DIY flat iron pad. AN EXCELLENT PORTABLE IRONING PAD: Compact, feather-like and easily fitting in your handbag or luggage, This wool pad will make your tabletop ironing pad in the hotel room, the college dorm and wherever you are. A THOUGHTFUL GIFTING IDEA: Treat a loved quilter, embroidery enthusiast or DIY crafter to an unforgettable gift! Offer this easy press mat on all gifting occasions and help them get flawless ironing results in a breeze! Show off your excellent taste! YOUR 100% SATISFACTION IS OUR TOP PRIORITY: This is why we back our flat iron heat pad with Full Refund Policy and our prompt & friendly Customer Service, to provide you with an experience to remember. So, buy with confidence, as you have nothing to lose! Project Wool is a Family Company in the USA dedicated to honest, quality craft accessories. Competitors' "100% wool" pads are made from industrial felt which is over processed wool blended with low quality fibers that can scorch and damage your craft or sewing project. Chinese wool is especially questionable. We want to be the first to be open with the truth, and provide a higher quality wool pressing mat. With Quilters and crafters in mind, our USA mill has designed a propriety wool ironing pad for quilting which combines a small percentage of high quality, extremely heat resistant fibers, with pure new wool. It will not wrinkle, buckle, burn, or stain. We are proud to provide you with quality craft and sewing accessories. USE: Iron or press as usual. 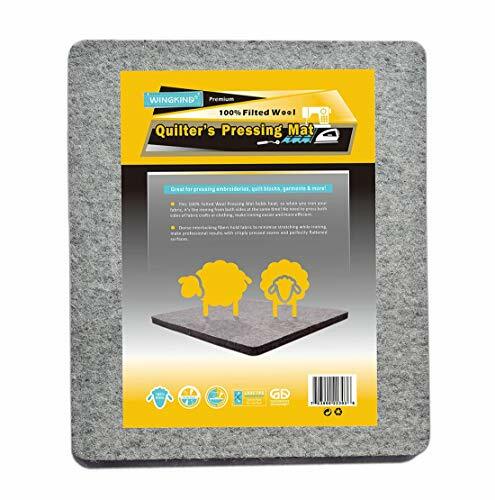 Quilters Best felted wool pressing mat will hold your project flat and prevent sliding or wrinkling. Thick wool absorbs and retains heat to press your project from below while you iron from above, saving time and effort! Safe for use with steam, starch, pins, etc. Pad may be washed gently in cool water and air dried. Our wool ironing mat is pure, new, and has not been subject to damaging processes. It smells like wool! However, depending on use we have found the smell has disappeared within two to three weeks. PLEASE NOTE: As with all wool ironing pads, if used with steam, moisture may penetrate. 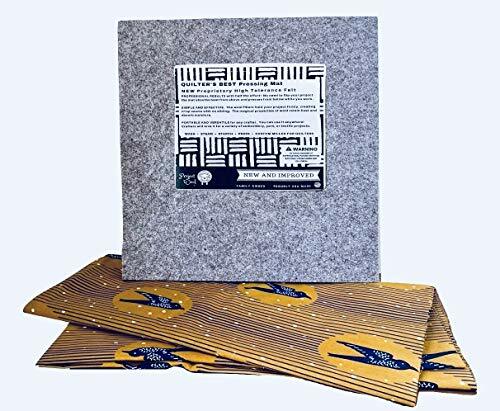 While your felted wool pressing pad may be used on any surface, please check under your mat when used on a craft surface that may be damaged by heat or moisture. Your happiness is important to us. If something is wrong, we promise to make it right - guaranteed. Please expect a personal response to any questions, comments, or suggestions. PURE WOOL: Our USA made 14x14, 1/2 inch thick wool pressing mat for quilting uses quality wool from sheep in New Zealand and Australia. EASY: Press your sewing or quilting project as usual. The wool pressing pad absorbs heat and irons from both sides, while wool fibers securely hold your fabric in place! PORTABLE WOOL IRONING MAT: One of the best travel accessories! Travel sized, but large enough for convenient use on any craft project. 100% WOOL PAD? NO SUCH THING! - 100% wool wrinkles and warps. 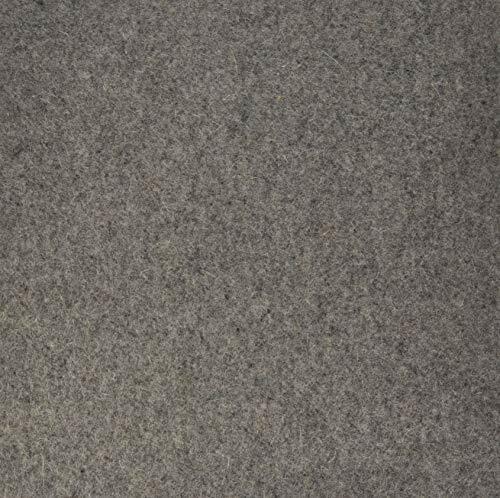 Competitors' industrial felt uses low grade filler fibers that could burn or stain your project. We are the first to create an HONEST solution. Questions/comments - we are here for you! 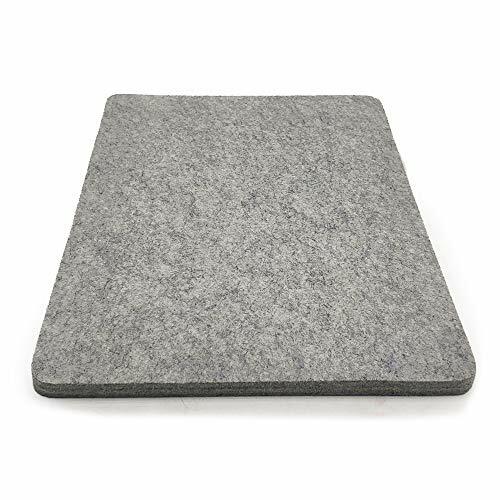 CUSTOM DESIGNED FOR QUILTERS - Our felted wool ironing pad for quilters uses the highest quality fibers to keep the primarily pure wool pressing mat from wrinkling or burning. It outperforms industrial felt in every way, or your money back, HASSLE FREE. SATISFACTION GUARANTEED. You can use any setting on your iron including the wool setting when ironing. We do not recommend using starch however alternatives such as Best Press can be used. Do not leave your iron on the wool mat for too long. Iron setting : use WOOL or MEDIUM HEAT for best results. Use of steam: With prolonged use of steam during ironing, a small amount of moisture can pass through the mat, since wool is a porous material. Drying: When wet, simply hang to dry. Avoid twisting or bending. Storage: Avoid folding or rolling. Find a flat surface and place it there. Also avoid storing the mat when it is damp or wet. For people sensitive to wool fragrance: you may experience a slight smell of wool at the beginning, not to worry, it fades off after a number of use. Rest assured the odor will not be transferred to your fabric and disappear soon after your ironing is done. 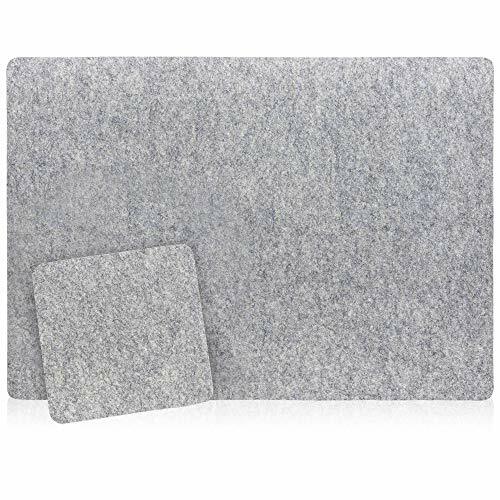 Size: 12" x 18" x 0.5" - This 100% Pure Felted Wool Pressing Mat is creates a perfect pressing surface for your embroideries, quilt blocks, garments, ect. Great for Sewing - The Skinny Pressing Mat is designed for the garment those that sew. Its long and skinny shape is perfect for sleeve and pants seams. Holds the Heat-We advise you to start at a lower heat due to the amount of heat the mats hold. 100% Satisfaction Guarantee- - Please Contact us for any Questions. We will Reply Within 8 Hours and Help Solve the Problem Until you Are Satisfied. 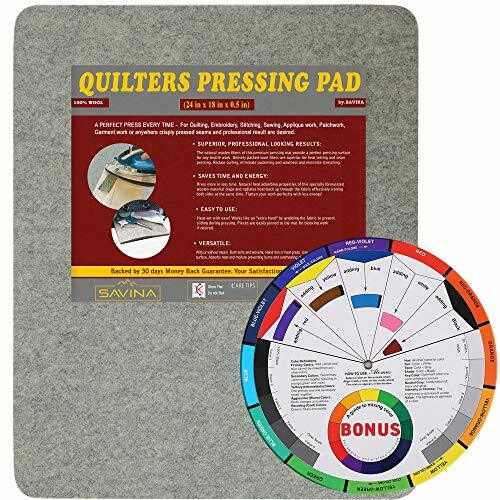 12" x 14" Quilter's Pressing Pad - 100% Wool Ironing Mat, Provide Professional Results for Quilting Projects. Natural 100% WOOL - Great for Quilting, Embroidery, Sewing, Applique work, Patchwork, Garment work, or anywhere crisply pressed seams and professional result are desired. This 100% Felted Wool Pressing Mat holds heat, so when you iron your fabric, it's like ironing from both sides at the same time! No need to press both sides of fabric crafts or clothing, make ironing easier and more efficient. Works both with or without steam for professional results. Performance: Dense interlocking fibers hold fabric to minimize stretching while ironing, make professional results with crisply pressed seams and perfectly flattened surfaces. Portable and lightweight. It's a great choice for travelling, retreats and any other places you need to take it to. 100% Money Back Guarantee. Buy with confidence, as you have nothing to lose! Time efficiency - Because you are effectively ironing both sides at the same timethe result is quicker and earns better results. Whether you're looking for a tabletop ironing pad for home,the college or the workplace or a portable side-table ironing mat for sewing orembroidery, you've got it! Easily carried in your handbag, backpack or luggage, thisquilt mat will ensure ironing perfection at home, in your travels and in yourrefreshing camping weekend. Best Quality - We know this 100% Wool Pressing pad is the Best Quality and willlast a lifetime, Please contact us for anyquestions. We will reply within 8 hours and help solve the problem until youare satisfied. Offer it as an original gift on all occasions and put awide smile on the face of the lucky recipient! 100% WOOL - pressing mat absorbs steam essentially pressing both sides at once. 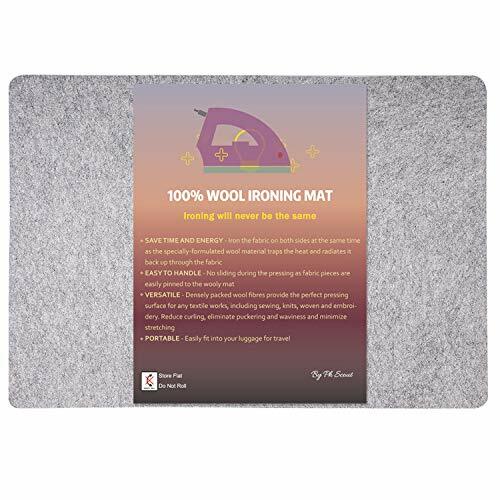 GREAT FOR SEWING - Designed in the ideal shape for convenient ironing, this wool heat pressing mat makes your handy sewing iron pad for detailed sleeve or pant seams ironing, your or your DIY flat iron pad. GOOD QUALITY - Dense interlocking wool fibers of this pad hold the fabric to minimize stretching while ironing. Stretching often happens with half-square triangles and piecing done on the fabric bias but this portable ironing pad helps to prevent that leaving crisp seams without stretching. 100% SATISFACTION - Please contact us for any questions. We will reply within 8 hours and help solve the problem until you are satisfied. Magnetic Pin Bowl Red Dots by Riley Blake Designs. Works upside down. 4 inch stainless steel bowl has a 2 1/2 inch strong rubber coated magnet on the bottom. Powerful magnet keeps pins secure. Wide magnetic base for stability. 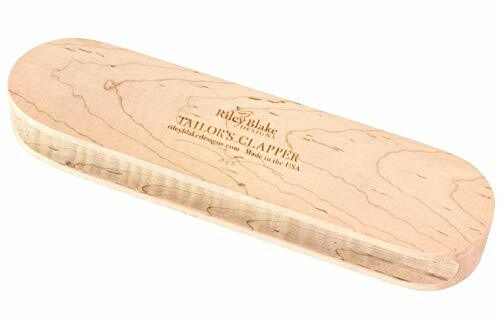 12 Inch Quilters Clapper. This classic tool is used with a steam iron to set a seam. Made in the USA. Tailor Wooden Clapper Tool for use with Steam Iron to Set a Seam in Piecing. Quilting, Sewing, or any Fabric Craft Project with a seam to set. PORTABLE - Easily fit into your luggage for traveling or camping. Fits in small place to save you space. YOUR 100% SATISFACTION IS OUR TOP PRIORITY: This is why we back our flat pressing pad with Full Refund Policy and our prompt & friendly Customer Service. So, buy with confidence, as you have nothing to lose! 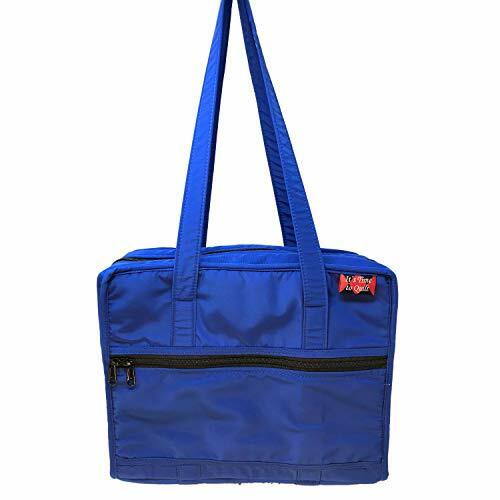 The Quilters Organizing Tote has 14 zippered pockets of varying sizes including one on the front of the tote for easy access. 4 pockets are 13" x10" and will hold scissors, spools of thread and rotary cutters nicely. There is elastic to hold your pencils, seam rippers and invisible markers. Smaller pockets hold your rotary blades, pins and needles. The shoulder straps are 11.5 inches from shoulder to top of bag making it easier to put on your shoulder. We can put everything needed for a 4 day retreat in this bag--and zip it closed--except for an iron, an It's Time to Quilt 14" x 14" Quilters Pressing Pad (my favorite wool pad), and longer rulers. We designed this tote for quilters but it would be perfect as a travel bag for makeup, jewelry, toiletries, lotions, etc. All in one place! For Lego geeks, the sections would be perfect for storage for all those tiny pieces you need to keep separate.